Veggies Rule: Where Does It Go? Being a vegetarian in this country is a little unusual, of course, being vegan is just downright weird…but I'm not here to discuss the questions that I get asked, nor to ponder on the reasons this place is still a bit behind the 8 ball. I was on the Vegetarian Forum today discussing quinoa and it got me thinking about how the different supermarkets approach vegetarian/vegan food. So, as quinoa has already been mentioned, let's use it as the example. Now I do realize that most people here in N.Z. haven't got a clue what quinoa is, they still pronounce it quin-o-a instead of keen-wa, but you would think that the supermarkets would have some inkling of an idea as to what type of food it is. Well, I'm here to tell you that I have found quinoa on a variety of different shelves in a variety of different supermarkets. I've found it in the pasta section, the baking section, the gluten free section (yes, that's not too bad a choice, but not one that I'd go to straight away), it's been in the rice section and in with the cereals. 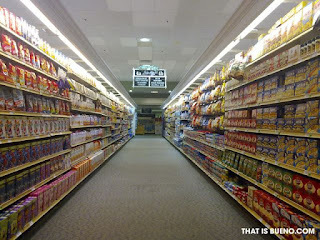 Sometimes I find it in the "International" part, the snacks aisle and once I was directed to the condiments - bizarre! The strange part is that if I go back to the same supermarket it can quite often be shifted and I have to start the quest all over again. I'm at the point now where I just start laughing…..no point getting upset…..at least they do offer quinoa albeit one brand. I thought maybe I should write to the supermarkets and tell them to create a new section: "Don't Know What It Is" - I'm sure they'd fill it up pretty quick. Oh, and I can get it at my local health food store, no problem....I'm talking supermarkets - I would think it would go where the couscous goes.......any advances on that??? ?